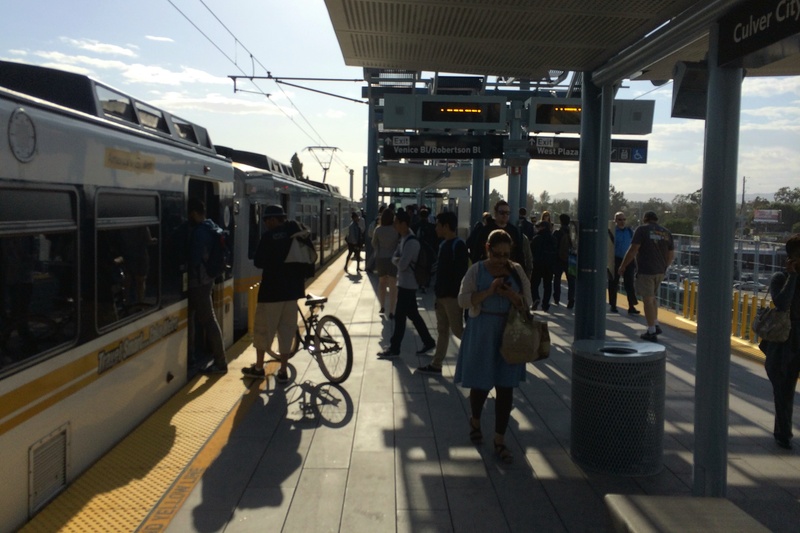 The Expo line will not reach Santa Monica for a year and a half or so, but I have already become a regular user — that is, if taking the train about once a month equals regular use. It all has to do with avant-garde music and the fact that my wife teaches at USC. You see, starting about eight or nine years ago we began attending the wonderful Jacaranda chamber music concerts at the First Presbyterian Church on Second Street. Jacaranda presents concert music going back centuries (check out tomorrow night’s concert with music from Mozart, Debussy and Arvo Pärt), but for Jacaranda the history of music didn’t end in 1900. Before Jacaranda, my wife and I didn’t pay much attention to new music, but now we’ve become addicted. The L.A. Phil presents a prominent concert series, called Green Umbrella, for new music on Tuesday nights about once a month in Disney Hall, but we never attended those concerts because weeknight traffic is so miserable from Santa Monica is to downtown L.A. That changed, however, when Expo reached Culver City. My office is in downtown Santa Monica. I board the Metro 534 bus on Fourth Street at Santa Monica Place around 4:30; from there the 534 travels non-stop on the freeway to the temporary Expo terminus in Culver City. The train takes me to USC in 14 minutes, where I meet my wife; she has her car there because she drives in in the morning. We drive to a restaurant downtown, and then go to the concert. Obviously our circumstances are unusual and won’t apply to many others, but in taking Expo at least I’ve learned something about it. To begin with I’ve learned whom Expo will serve when it reaches Santa Monica. The 534 originates in Malibu and when I board it at 4:30 it is full of workers returning to L.A. from jobs along the coast. I’ve been told the 534 is called the “nanny bus,” but nanny hardly encompasses all the people on it. Class defines transportation in L.A., yet it still surprises me when friends tell me they have never taken a bus here. (They have no problem with using transit in New York.) Some even confess that they are “scared” to do so, but when I’m on the 534 I feel like I am among 40 of the most dignified people in all of L.A.
At that time of day the 534 takes between 30 and 60 minutes to travel from Fourth and Colorado to Culver City (it takes 10 minutes when there is no traffic). Typically, more than half the passengers exit in Culver City to get the train. When Expo opens in Santa Monica, the train will take about 15 minutes from downtown Santa Monica to Culver City. That means that all those 534 riders who connect with the train will do so in Santa Monica and save between 15 and 45 minutes each trip home. These workers and others like them are the people whom Expo will serve immediately. The primary purpose of Expo is to provide access to jobs on the Westside and in downtown L.A. to the vast middle of Los Angeles, home to much of L.A.’s working-class. By doing this, Expo (and the Crenshaw line scheduled to open in 2019) will help reverse half a century of dis-investment and decline in South Los Angeles. Already Expo is prompting investment in those areas, as the L.A. Times reported last week. Indeed, another group of Expo users don’t even know who they are today – they are the people who will move to neighborhoods near Expo, or to apartment buildings and condos along the line that aren’t yet built. Economists and planners have long understood that transportation shapes land use and can create or destroy wealth. If you run a freeway through an existing city, it typically reduces property values along the way (while increasing them where the freeway reaches open land), while rail does the opposite – it increases property values along the route. It’s through this increase in economic value that transit pays for itself at the macro-economic level. If you ride Expo, and look out the window, you’ll see many derelict properties that will be redeveloped over the years with new housing and businesses. These land use changes don’t happen overnight, but gradually new development gravitates toward transit. Thirty years from now, many riders on Expo will live in buildings that don’t exist today. It is changes in land use over time that result in a greater percentage of commuters and other travelers not driving. Santa Monicans are asking themselves if they will use Expo. I hate to say it, but initially I doubt many will. This is for various reasons. Because the Exposition right-of-way originally passed through industrial areas of the city, few Santa Monicans now live with walking distance of Expo stations. In addition, because of the number of jobs in and near Santa Monica and how the traffic pattern now favors residents such as my wife who leave Santa Monica to work, Santa Monicans already have lower than average commute times and few Santa Monica commuters are likely to benefit from a switch to Expo. 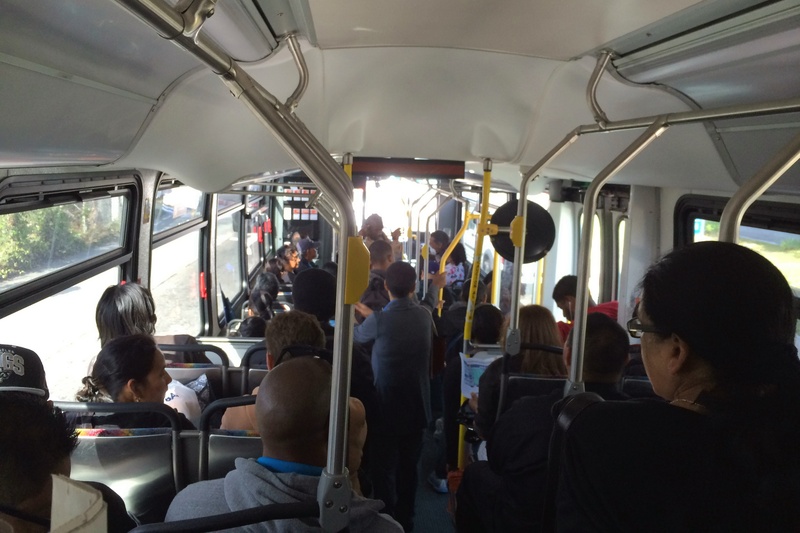 Meanwhile the Big Blue Bus is exploring how to set up buses and shuttles to connect with Expo, and to do this Santa Monica has some advantages. Transit lines usually connect city centers with jobs to areas on the periphery with residents, and most riders go in one direction in the morning and the other later on, but Santa Monica has both residents and jobs. This means that connecting buses in the morning and afternoon rush hours can carry passengers in both directions, making them more efficient. Which brings me to a simmering controversy in Santa Monica – should the City build parking at our Expo stations? The answer is no, or at least not much of it, and none of it subsidized. There are many reasons for saying no to building parking at the train stations. One obvious one is traffic. Do we want to create more incentives for people to drive to downtown, the Memorial Park area, and Bergamot? “Park and ride” means “drive and ride.” But the most fundamental reason to oppose building parking is economic: parking costs too much, and let’s face it, when people say they want parking they mean free or heavily discounted parking. The construction cost per parking space in the new Structure 6 on Second Street was about $50,000. Let’s say you wanted to build a five-story, 500-space structure near an Expo station. That would need a footprint of about 33,000 square feet. Land cost (at $400/square foot, typical for prime land in Santa Monica), plus construction cost would mean the structure would cost about $38 million, or about $75,000 per space. Assuming the City would pay for this with a 30-year, 5% bond, the monthly amortization for each space would be $403. Add a typical maintenance and operations budget of 15 percent, and the monthly nut that needs to be recouped is about $450 per space, or about $15 per day (including weekends). The cost of providing parking at stations is not only, however, a matter of dollars, but also a matter of opportunity. The land near the stations is prime land, and if it’s used for parking, it can’t be used for housing. There is much more social value in building housing near transit than there is in building automobile storage for people who already have housing and can afford to own and operate a car. Public dollars are better spent subsidizing housing, and much of the housing we need can be built without subsidy. This entry was posted in Uncategorized and tagged Expo line, Jacaranda Music, parking at transit, Santa Monica Expo line by Frank Gruber. Bookmark the permalink. 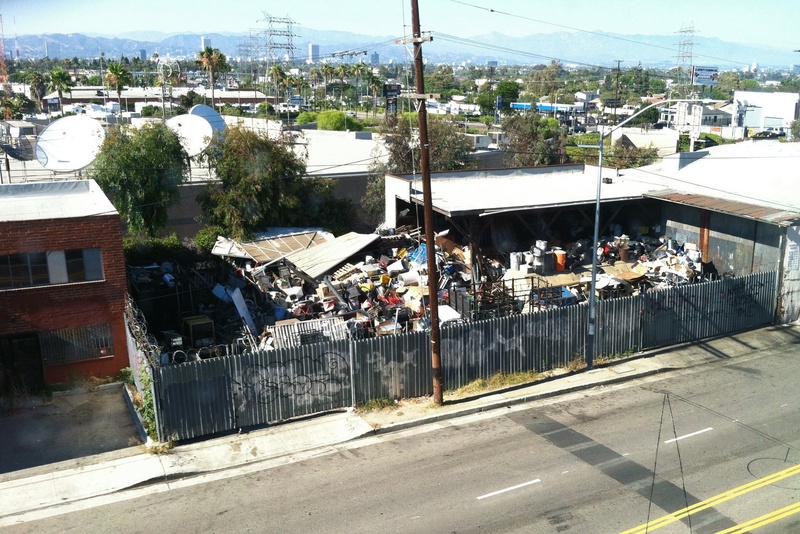 Frank, those “derelict properties” you show in the photo are actually unglamorous but relatively thriving small businesses that provide important services and jobs to the community along that corridor. Once property values increase they will be displaced; a problem that demonstrates the complexity involved in public policy decisions covering transportation. I’m a huge supporter of light rail and this line in particular, but we must not close our eyes to the full picture. Dan — I won’t argue the point — you know I’m always in favor of finding more complexity — but cities die more often from lack of investment than from too much investment, and South L.A. is a long way from having too much investment. But viva complexity. I’m surprised the the Big Blue Bus doesn’t have a line that runs directly from the Expo Culver City area to the job centers of Santa Monica, such as the Water Garden area, and Downtown. They do have the 5, but it’s an hour between the Expo and Santa Monica, added on to however long it takes one to get to the end of the expo line. I did see recently that there is a Rapid line going between Downtown Santa Monica and the Expo Culver City Station, but the hours are geared toward those leaving SM. There’s nothing weekday mornings heading into SM (service starts in that direction in the afternoon). Seems odd since so much of the problematic traffic is from people coming into Santa Monica to work. Neither Metro nor BBB have addressed this, which I find to be a missed opportunity to get some people out of their cars. As great as the trains are, if a large part of the journey involves a bus traveling in the same traffic one would be in their a car (a journey of which takes even longer due to stops etc.) then it’s less an issue of class and one of logistical convenience. I agree 100%. The “Rapid 20” is a nice idea, but it only runs at odd moments because it uses up some kind of down time on the BBB 12, and it only connects downtown SM to CC. What I don’t understand is why Metro or BBB didn’t create a line that would start at the CC terminus and hit only the future stops of Expo. It’s quite possible that they looked into this and determined that it wouldn’t go fast enough on surface streets, and stuck with the 534 and instigated the Rapid 20, but there really should be a straight shot from the Expo terminus to the jobs centers around Bergamot and then the hospitals. Thanks for this great read. Lots of good reflections here, and I hope that you continue to speak to folks about these important insights. And, frankly, your use of the Expo Line as a means to get to your wife and then drive home at night is a perfect example of mixing modes for a round-trip that actually makes all the more sense why we need mode options. If you didn’t have the Expo Line as an option, you’d probably be more likely to drive downtown, which just adds another car to already-congested roadways and then results in you and your wife have to drive home separately later that night. What’s interesting to see in how Santa Monica embraces (or doesn’t) the Expo line is that 50 years ago whole neighborhoods were decimated for freeways that, while now enabling ease of traveling during off-peak hours, have just given incentive to thousands more people to hop in their cars, thus disinvesting in transit, biking, and walking in ways that we haven’t fully grasped, meanwhile adding thousands of tons of greenhouse gases into the atmosphere, pushing people further and further apart, and making our cities less friendly. Meanwhile, this new Expo line will have minimal impact on rights-of-way in Santa Monica, but to hear some folks gripe about proposals for increased development in a few places where it makes sense along the new line you’d think they’ve completely forgotten about how disruptive the freeway has been for so many decades to so many people. Thanks for this positive article, Frank. My husband and I have taken the Expo line several times to explore areas in LA served by rail. It is great to host relatives from back east and to demonstrate that LA has joined the transit generation in a big way. Which debunks many of their negative impressions of our region. If I were still working downtown and in Koreatown and Hollywood, I would be a regular user of the Expo line when completed. In fact, the CRA/LA located all its site offices near rail/subway transit stops. Kind of doesn’t matter now, but it was far-sighted at the time. Now we need to build more housing by our Expo stations and hopefully alleviate the westbound gridlock on the I10 in the morning and eastbound in the afternoon. Good show!